Provide comfort for the family of Jacqueline Greiner with a meaningful gesture of sympathy. Jacqueline R. Greiner (nee Carlson), age 90, of Mount Laurel, NJ passed away on Tuesday, January 29, 2019. Mrs. Greiner was born in Camden, NJ and was raised in Southern New Jersey before moving to Mount Laurel, NJ. 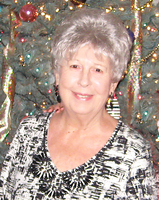 She was a devoted member of Saint John Neumann RC Church and also a 20+ year member of the Mt. Laurel Garden Club. She also served on the Deborah Heart and Lung Center Ladies’ Auxiliary and St. Mary’s Nursing Home Auxiliary. She loved the theater and appeared in several plays for the Burlington County Footlighters (Cinnaminson) in the 1960’s. In her leisure, she enjoyed studying history and politics, gardening and music. But above all else, she cherished the time spent with family and will be deeply missed by those she leaves behind. Jacqueline was predeceased by her spouse, Norman E. Greiner. She is survived by her daughter, Linda Greiner; sisters, Diane Carlson and Barbara Franckle; nieces Laurelle Lowe, Beatrice Burdsall, Pam McLaverty, Kim Gill; nephews John Craig and William Franckle. A viewing will be held on Friday, February 1st from 6:00 to 8:00 PM at the Mount Laurel Home for Funerals, 212 Ark Road, Mount Laurel, NJ. Mass of the Christian Burial will be celebrated 10:30 AM on Saturday, February 2nd at Saint John Neumann RC Church, 560 Walton Ave, Mount Laurel, NJ. Final disposition will be private. In lieu of flowers, donations may be made in Mrs. Greiner’s memory to the Shetland Sheepdog Placement Services of NJ, 370 Union Avenue, Bridgewater, NJ 08807. Please accept my deepest condolences to your family. I would like to offer encouragement to your family for the loss of your loved one. The Bible offers immense comfort and many wonderful promises from God foretelling an end to our enemy death. The scriptures at Isaiah 25:8 says, “He will swallow up death forever…”. Also at Revelation 21:4 it says, “And He will wipe every tear from their eyes, and death will be no more, neither will mourning nor outcry nor pain be anymore. The former things have passed away.” Please read these verses in your Bible and feel free to find additional comforting scriptures at jw.org. My family and I would like to extend our deepest condolences for the loss of your love one. May the true God mend your family crushed and broken hearts, and may your family be comforted by God’s promise of the resurrection.~John 5:28,29 which assures us that we will see our love ones again.